Earning the overall title in a national or provincial short track travelling race series is an impressive accomplishment. Achieving that level of success in back-to-back seasons – before your 20th birthday – is a goal that most drivers will never reach. Orono, Ontario’s Brandt Graham made his debut with the Lucas Oil Sportsman Cup Series at just 17 years of age. Before the end of his first season on the tour, the youngster had earned a place in the record books as the youngest main event winner in series history and was also named rookie of the year. After his sophomore term, the second-generation speedster was crowned the group’s overall champion at the age of 18. 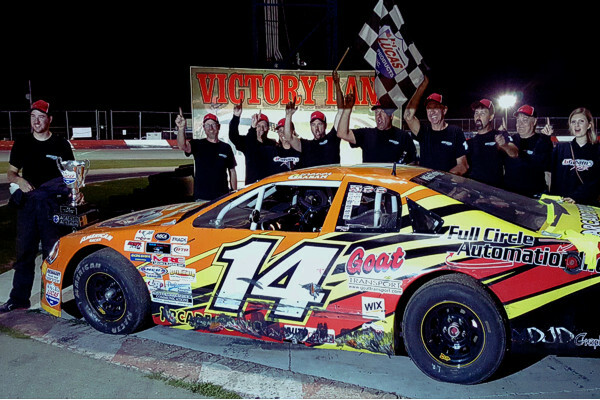 After his 4th place finish in the Basement Stores 100 – Saturday, September 16th, at Flamboro Speedway – Graham clinched his second consecutive championship. After setting fast-time during qualifying, the #14 machine started in second place on the grid as result of the fan-participation ‘Fast 5’ draw. With the 100-lap advertised race distance split into a pair of segments, Graham and his team knew where they’d need to finish in order to claim the title. They signed-in at the pit gate with less than a 10-point lead in the standings and after the checkered flag, came away with just an 11-point cushion on the driver in second place. Brandt Graham and the entire Graham Racing team would like to thank their sponsors, crew, family, friends and fans for their unwavering support throughout the 2017 campaign. The team will take some time to unwind and enjoy the honour that comes with being able to repeat as Lucas Oil Sportsman Cup Series champions, before making their plans for the 2018 season. Time trialed 3rd, started 4th (after fast 5 redraw). Finished 2nd. Time trialed 2nd, won both 50 lap segments. Time trialed 1st, started 5th (after Fast 5 redraw). Finished 3rd. Time trialed 1st, started 1st (after Fast 5 redraw). Finished 1st. Time trialed 2nd, started 3rd (after Fast 5 redraw) won 2 30-lap segments. Time trialed 1st, started 2nd (after Fast 5 redraw), finished 4th overall. Graham Racing is pleased to have sponsorship support from Full Circle Automation, Arcade Pools, J & M Restoration, Hot Rod Swag, Goat Transportation Inc., Auto Care, Mayhew Graphics and DJD Graphics for this year’s program. Follow the team behind the scenes and at the track by checking @Graham_Racing on Twitter and the Graham Racing page at www.facebook.com. Look for www.graham98racing.com, an Image Factor web-site. Clarke Motorsports Communications is proud to support the 2017 season for Graham Racing. Brandt Graham celebrates with his family, friends and crew members after clinching his second-straight Lucas Oil Sportsman Cup Series championship – Saturday, September 16th – at Flamboro Speedway.